Mattel Blasts Off BOOMco.™ the Next Generation in Adrenaline-Fueled Fun | Mattel Inc.
EL SEGUNDO, Calif.--(BUSINESS WIRE)-- Mattel brings new style and attitude to active play with BOOMco.™, a ground-breaking innovation in blaster technology. Only BOOMco.™ uses Smart Stick™, a cutting-edge dart and target system that's paired with amped-up blasters to bring kids the ultimate in high-energy play. Celebrating its global launch, product is now available in select markets including UK, France, and Benelux. International market rollouts will continue over the next few months with a North America debut in July timed to the active outdoor summer play season. "Utilizing innovative Smart Stick darts, targets and shields, BOOMco. gives kids a revolutionary new blaster experience that challenges them to get outside and play," said Doug Wadleigh, Senior Vice President, Global Brands Marketing, Boys and Entertainment for Mattel. "The Smart Stick system combined with high performance BOOMco. blasters enable kids to create almost limitless new ways to play, in a world where imagination meets action." BOOMco.™ Twisted Spinner™: Boasts an impressive 310° rotating barrel with the ability to blast darts up to 70 feet. The blasters fast-acting, push-button transformable shields incorporate Smart Stick™ technology allowing players to efficiently capture opponents' darts. Removable shields create heightened challenge and the included 8 Smart Stick™ darts and Smart Stick™ target make the heat of play just a blast away. Recommended for ages 6 and older. BOOMco.™ Rapid Madness™: This air-powered blaster can fling 20 Smart Stick™ darts in just seconds. With the capability of blasting up to 50 feet the BOOMco.™ Rapid Madness™ is the perfect companion for fast action, adrenaline-fueled competition. The blaster includes a quick push-button, removable transforming Smart Stick™ shield for the fun catch and defense of darts. Includes 30 darts and is recommended for ages 6 and older. BOOMco.™ will be supported by a strong digital presence where fans can continue to engage and interact on popular platforms. For captivating thrills the BOOMco.™ YouTube channel offers pulse-pounding content such as blaster-in-action videos, cool behind-the-scenes footage, and more. The BOOMco.™ Instagram account will feature epic blaster photos and other visual play inspirations. 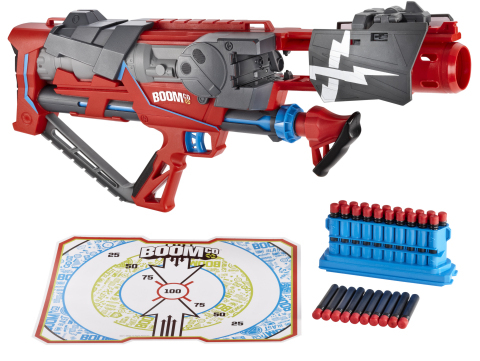 Additionally, BOOMco.™ will be issuing monthly challenges to fans that will show fun ways to play with the new blasters. BOOMco.™ mobile apps released later this year will feature exciting gaming options and the ability to record and edit favorite action moments. Visit www.boom-co.com for updates on availability.